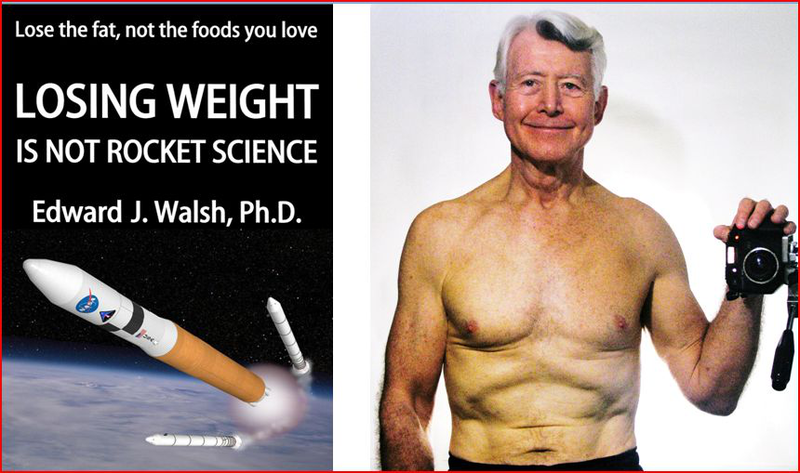 LOSING WEIGHT IS NOT ROCKET SCIENCE Dr. Ed Walsh, retired NASA scientist and recipient of the NASA Medal for Exceptional Scientific Achievement, describes the simplest and easiest way to rid your body of excess fat to attain and maintain your ideal weight. Without changing what you eat or how much you exercise, you can achieve an exponential decrease in your excess fat. After being New England Judo Champion when he was 26, his weight inched up little by little over the years. When it hit an all-time high 10 years ago, he decided to take action and dropped 44 pounds of fat. You can maintain your weight loss, as Ed demonstrated with his recent selfie at 72. It costs nothing to implement, requires no medication and no bookkeeping. His graphs show you what other books don't, how fast you can expect your weight to decrease, and how easily you can recover when a disruption causes you to pig out.